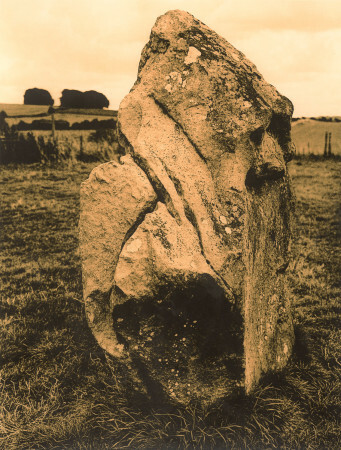 Avebury – the ‘Druid Stone’? Disregarding any magical interpretations, this is a lith print on FOMA Fomatone MG Classic processed in Moersch EasyLith 1+1+40 @ 24ºC for 5 minutes. The negative was made on my Fuji GW690III using Kodak Tri-X film processed in PMK. 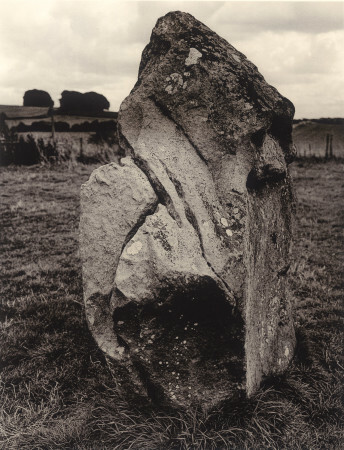 The base print exposure was 1.5mins at f8 for a 8½x11¼” print; the bottom half was shaded for 30 sec, top half burned-in for additional 30 sec; no variable contrast filtration (it makes little difference to lith prints). The first print I made had no burning-in at the top so, in an attempt to intensify the development in that area, I rinsed the whole print in plain water and then dipped the top half back into the developer for an additional 2-3 minutes. Unfortunately this gave the area a different colour in that area, which looked odd. In an attempt to rescue it I completed processing and then used gold toner to even out the colour. Here’s what that print looks like now. Of course gold toning doesn’t turn prints gold as it might suggest, it actually imparts a bluish cast. This had the effect of evening-out the darkened, different-coloured area at the top, but the over-development in that area is still appearing a bit harsh. I prefer the straight lith print at the top where burning-in was done at the time of exposure, ensuring even development colour. This entry was posted in 120, 2nd-pass Lith, Chemical Lith Process, Film negative, Gold, Silver Gelatin. Bookmark the permalink.